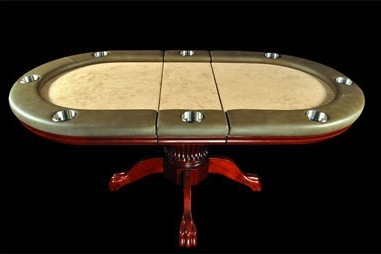 Poker tables come in two common shapes - oval and round. You'll occasionally see an octagon or a modified oval shape but the standard oval and round are going to be the popular choice and more widely available. These two main shapes can be scaled up or down but we'll explain some of the pros and cons of each shape. Most poker players are accustomed to playing on oval tables as all casino poker rooms are outfitted with large oval tables to accommodate the most players possible. The classic oval shape allows efficient dealing of cards with the dealer sitting in the middle. So if you desire the professional style table worthy of the top casinos, consider a large 8 foot long oval table. If you don't have the square footage available to support a full size oval table, luckily, ovals come in various sizes and if you absolutely need a specific sized table consider building a table from scratch or hiring a local table builder. If you have a large number of players, oval tables will be able to accommodate more players comfortably. While the oval is the poker classic, the round shaped table may be the most versatile. Of course you'll have to consider the maximum number of players you'll have at your game as you'll be hard pressed to find a round table that seats 10 players. But if you never have more than 8 at your table, a round table has numerous benefits. First of all, it takes up significantly less space than its oval counterpart so those who are tight on space will tend to lean towards this shape. Very few home poker games will have a designated dealer the whole time and let's be honest, nobody likes to play dealer. So for most games, you'll pass the dealer button around the table and share the responsibility. Using this method on a large 8 foot table makes it tough if you're sitting at the far ends of the table to deal all the way across. 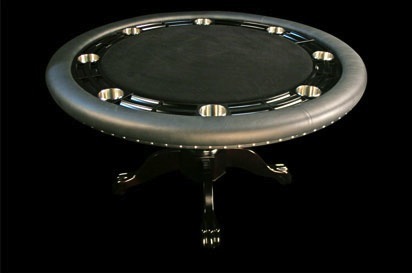 With a round table, dealing to all players is a mere flick of the fingers away with little to zero strain.